The three topics discussed in Chapter 1 provide basic background knowledge. It begins with the introduction to Ecology and its relationships to other sciences, as well as the importance of its study. This chapter explores the components of the environment, which are the biological components (biotic) and the physical components (abiotic). It describes the different types of biomes and the interactions of the organisms with their environment, as well as with other organisms. Chapter 2 also discusses how energy flows through ecosystems and matter moves in numerous cycles from one part of an ecosystem to another, from one organism to another, and from living organisms to the nonliving components of the environment and back again. It addresses the science of natural resources such as soil, water, wildlife and fossil fuels; their uses and availability and the consequences that arise when they are overexploited. Issues concerning the value of the natural services these resources render to mankind that are overlooked with their economic values are also addressed. Chapter 3 presents the mechanisms of population to maintain its equilibrium and the pressures of population growth on the natural systems with a focus on demographic transition. It has a brief introduction on how birth rates and death rates influence population size. 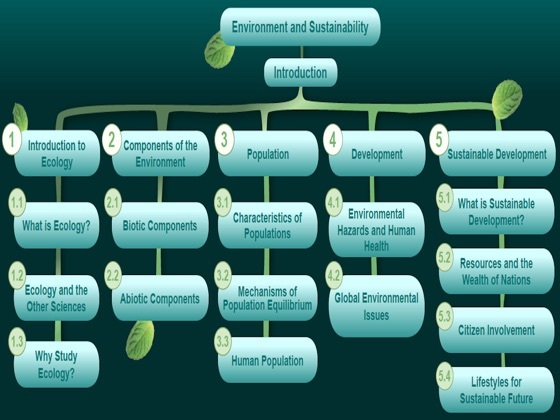 Chapter 4 presents how human population growth and development cause global environmental issues. It touches some environmental and social impacts brought about by growing populations. 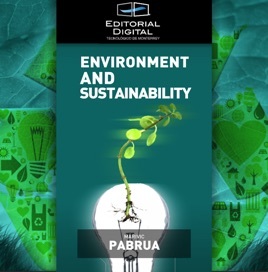 The last chapter addresses the relationships that exist between economics, public policy and the environment. It begins with a short introduction of Agenda 21, and then discusses the contributions of civil groups and movements focusing especially on present environmental concerns. It closes with healthy lifestyles, proper skills and practices to enjoy a sustainable future.